Horizontal lifting clamp PDB type details:Capacity from 0.8 tons to 16.0 tons. Jaw opening from 0 mm to 150 mm. Application: Horizontal lifting of steel plate, or transport steel plate. Horizontal steel plate clampraw material: low carbon steel alloy. Horizontal plate clamp features: Two pieces or four pieces are recommended for lifting operation works. For big sized steel plate, balance beam is needed for safety. Breaking load is four times of working load, and testing load is two times of working load. When operating please be sure the loaded goods not touch anything. CDH vertical lifting clamp also named CDH vertical steel plate clamp, CDH vertical lifting steel clamp and so on names. CDH vertical lifting clamp used for vertical lifting steel plates, steel structures and so on work pieces.CDH vertical lifting clamp has the spring-loaded tightening lock mechanism, which will assures a positive initial clamping force. CDH vertical lifting clamp details: CDH vertical lifting clamp capacity from 0.8 tons to 16.0 tons, Jaw opening from 0mm to 125mm.CDH vertical lifting clamp raw material is low carbon high quality alloy steel. All clamps forged and heat treated. Longevity and guaranteed safe performance. CDH vertical lifting clamp is durable to use, and easy to operating. 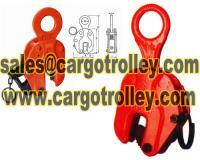 When working, two pieces lifting clamps are recommended for lifting operation. Regarding Steel plate lifting clamps pictures, Vertical steel plate lifting clamps structure, Horizontal steel plate lifting clamps application,please kindly feel free contact with us. Professionally service hope will get your satisfaction. Our company is specialized exporter, manufacturer and supplier of Vertical steel plate lifting clamps structure in China (Mainland),.